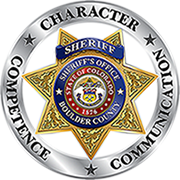 The mission of the Administration Division of the Boulder County Sheriff’s Office is to keep and preserve the peace in the county, enforce provisions of county ordinances, coordinate Emergency Services, maintain the Boulder County Jail, provide overall direction, review operations, and oversee financial planning and budget management. While these duties are shared throughout the Office, the Sheriff, as chief administrator and elected official, is ultimately responsible. The Sheriff’s philosophy is one of communication and cooperation amongst members of the Sheriff’s Office and other entities within the criminal justice system. Departmental issues, along with issues of concern to the community, are of high priority and dealt with in that manner. In overview of duties and issues of concern, the Sheriff is assisted by an Administrative Assistant and an Executive Staff comprised of Division Chiefs.